Roll fast, grip well and last a long time. That’s the three-headed dog that tire designers wrestle with in formulating tire compounding. It used to be that you had to sacrifice in one area to gain in another, i.e. tires that gripped well generally wore out quickly. But with the ability to apply rubbers of differing durometers (a measure of hardness) and characteristics it’s possible to create custom rubber compounds that roll fast, grip well and have excellent durability. We call our custom compounding Fast Traction and we worked closely with riders of every discipline in multiple regions to find compounds and tread patterns that excel in their given category. Whether it’s fast training rides muddy technical trails or desert sand and rocks, there’s a Fast Traction option to match where and how you ride. 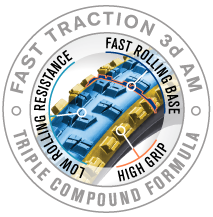 Fast Traction 3d AM utilizes the same dual durometer compound as our 2d AM with the addition of a rubber layer under the tread to increase straight line speed and reduce tread squirm while stabilizing center to shoulder transitions for greater predictability for aggressive cornering. 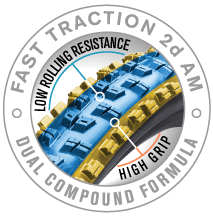 Fast Traction 2d AM is an all mountain specific dual durometer compound with a standard high durometer center section for speed and durability and extra soft durometer on the shoulders for extra grip for hard cornering. Fast Traction 3d XC utilizes the FT 2d XC dual durometer compound with an extra layer of rubber under the tread to help minimize tread squirm for greater straight line speed and control. 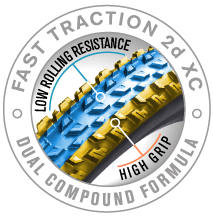 Fast Traction 2d XC is a dual durometer compound specifically created for the demands of XC riding. Higher durometer center tread provides lower rolling resistance for enhanced straight line speed and improved durability. Softer durometer sides improve grip for predictable cornering.